Spring and Summer provides the perfect weather to play outside barefoot! 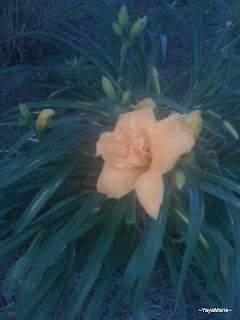 I saw this beautiful flower in my back yard. Life is the same way. Taking the initiative to take care of oneself is a choice. You can bloom like a flower or you can be the weed that gets stepped on and goes unnoticed. But weeds don't look nice in a flower garden, so they are always the first to go! Even when it rains in life, take those experiences as lessons and find some way to grow from them. Once you begin to bloom, others will notice. Flowers are a reminder that I am growing and adapting throughout life . Just make sure that you make it a point to stop. Splash through some rain puddles. Look at the flowers and remind yourself that your life & your health are just as beautiful!